I’ve been interested in Microscope since Thor pointed it out to me a few months ago. I bought a copy of it, but I haven’t had a chance to try playing it yet. It struck me, a couple days ago, that I might be able to do an online Microscope game with specific focus on the backstory for the adventure I’m working on. So, I’m going to invite all the current contributors to participate in a world-building game. I’m not sure if this will work well, or not, but in any case, I think it will help generate some ideas, even if I end up changing and revising things significantly from the game as it plays out. And it will be a chance to play a game of Microscope, as well. I’ll email the contributors about this shortly. If you’d like to get in on this, sign up as a contributor to the “Wilderness” fundraiser. I mentioned on the dq-rules list that I hoped to still have a holiday piece for those who have contributed. What I’m thinking of doing is gathering together and formalizing the Rank Point system I have used a few times to start off new campaigns or one-shots for conventions where I didn’t want to be stuck with beginning characters. Since “The Wilderness of A—” is going to be designed for mid-level characters, and people may not have existing campaigns, I think it would be good to have a framework for quickly giving players a way to assemble characters with more experience than beginning characters would have. You could certainly do something like this by just dumping 8000 XP (or whatever amount you’d like) on everyone and letting them go to town. But this would be a quicker, shorthand version. Of course, it would be possible to abuse the system, but in more instances, I think it could be used to quickly get a new character, or group of characters pulled together. There’s a map occupying the homepage on the Wilderness of A— Fundraiser page; what is it and where did it come from? This is a portion of the map from my Caldera campaign. The city at the center of the map is Gafton, where the campaign was based. It was just a black and white map, but I took a little while and added some color to it to make it more visually appealing. 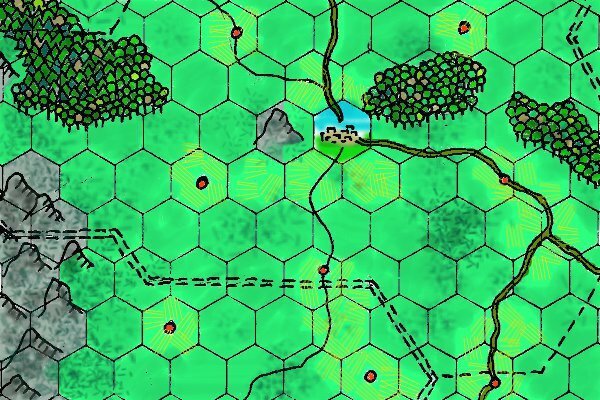 It’s a 5 mile hex scale; the scale of the DragonQuest strategic hex grid. While I don’t think it looks too bad, this is NOT the location I’m looking at for the adventure. It’s just here as eye candy (and hopefully you find it appealing like that). If you can use it in some fashion in your own campaigns, that’s great. 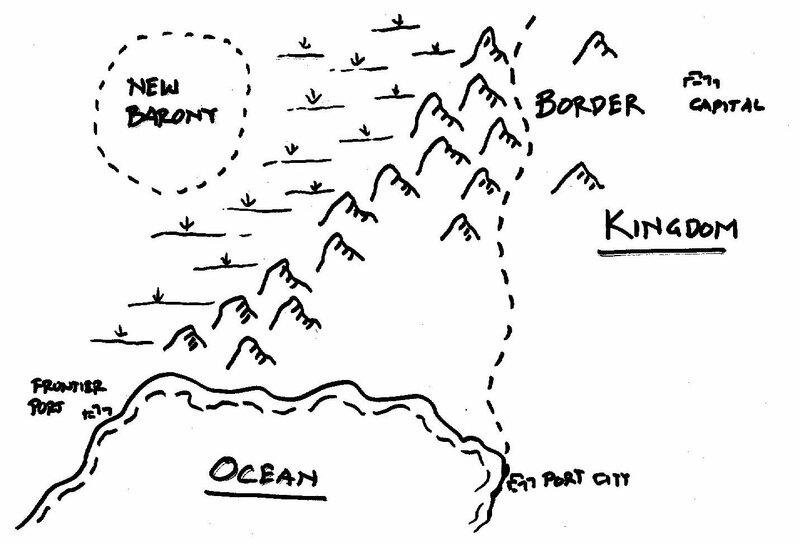 The issue at the heart of the adventure is the need for goods from the Barony having to go down to the Frontier Port, then sail across the Ocean to the Port City, then travel overland back up to the Kingdom’s capital. A direct road would be quicker; that’s the Baron’s project, and, since there is difficulty, that’s why he needs the help. * What kind of environment would fit in for most campaigns? Right now, I’m thinking of making it a combination of wasteland, forest, and mountain. * Should the adventure be located in relation to the Frontiers of Alusia? Even if someone takes the Hero – World Supporter perk in the fundraiser, these are going to be valid questions, so I’d appreciate your thoughts about it.